A terahertz laser developed at the Paul Scherrer Institute makes it possible to control a material’s magnetisation at a timescale of picoseconds (0.000 000 000 001 seconds). In their experiment, the researchers shone extremely short light pulses from the laser onto a magnetic material, where the magnetic moments – “elementary magnets” – were all aligned in parallel. The light pulse’s magnetic field was able to deflect the magnetic moments from their idle state in such a way that they exactly followed the change of the laser’s magnetic field with only a minor delay. The terahertz laser used in the experiment is one of the strongest of its kind in the world. One special feature is the fact that it is phase-stable, which enables the exact change in the electrical and magnetic field within the individual pulses to be defined reliably for each laser pulse. As the majority of data is stored magnetically these days, the possibility to quickly change a material’s magnetisation is crucial for new, rapid storage systems. The researchers report on their results in the journal Nature Photonics. 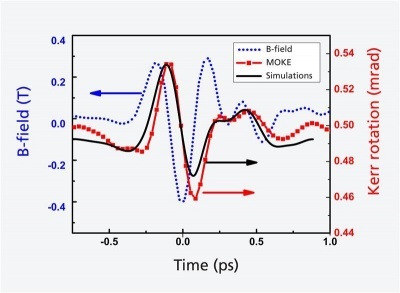 Figure: A pulse from a terahertz laser (blue) controls the magnetisation of a material: the magnetisation (red - determined via the magneto-optic Kerr effect MOKE) follows the laser pulse’s magnetic field with a slight delay. The black curve shows the prediction of a computer simulation.